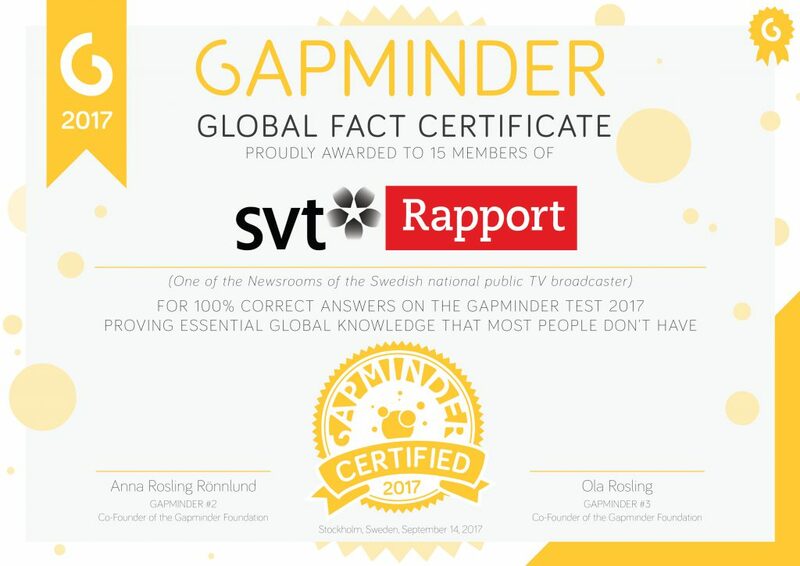 Announcement: Today the team behind SVT Rapport is the first newsroom in the world to get the Gapminder Global Fact Certificate! On September 14, 2017, we visited SVT Rapport, a newsroom of SVT, the Swedish national public TV broadcaster, which is one of the most trusted news sources in Sweden. We tested their core team of 15 people with fact questions about the state of the world. They didn’t score terribly bad, but just like most people (including journalists) they got most of our questions wrong. We lectured to them for an hour about the state of the world, and upgraded their worldview. Then we tested them with the Gapminder Test and then they scored 100% correct. And that makes them deserve the Gapmidner Team Certificate. Gapminder can now guarantee that the newsroom SVT Rapport have essential global knowledge that most people are missing. Dear Swedes! Next time you watch Rapport, you can feel safe: You’re not listening to a reporter with an overdramatic worldview. This is the first announcement of a Gapminder Team Certificate, which will become one of our most important strategies to fight devastating misconceptions at workplaces. In this way we can guarantee that teams of professional are up to date with the state of the world they work in. We can know for sure that people are not just enjoying an entertaining presentation, but actually learn form our lectures. Or stay tuned about this new strategy by following us on Facebook or Twitter where we will keep posting about this project.